These Gatekeeper Guides are wipe-clean A3 laminated and folded sheets for identifying British wildlife, both animals and plants. These are double sided with a different set of keys on each side. The Guides provide easy identification using key questions that are easy to follow and clear full colour illustrations which are attractive to study. Robust, easy to handle and a perfect wildlife reference for schools and nature lovers of all ages. This double sided key is for identifying common UK land invertebrates. 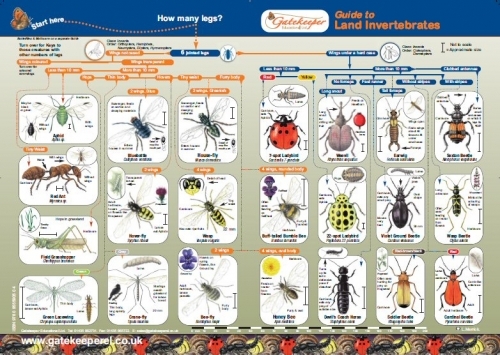 One side shows use of the key to identify insects, the other side is for identifying invertebrates with none, eight, fourteen or more than fourteen legs.